Socca recipes seem to be popping up a lot on food blogs and in magazines these days. If you haven’t encountered one yet, a socca is a pan bread that is simple to make and traditionally gluten free. It’s one of the easiest ways to have fresh baked comfort food. Plus, kids love making it and eating it too. 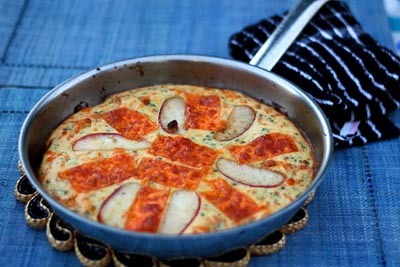 Alive magazine featured a recipe that caught our eye: Caramelized Apple Socca Spoon Bread. We tried it out (using Ambrosia apples, of course) and it was delicious but we decided to test out a savoury version. Guess what? That turned out great too! In medium bowl, whisk eggs together with milk. Add chana flour and whisk until smooth. Fold in chives and cheddar. Set batter aside. In an 8- 10 inch skillet, melt butter over medium heat. Add Ambrosia apple slices. Sauté until soft. Remove half a dozen slices. Add batter to apples in the hot skillet. Place remaining apples and any extra cheddar you like on top. Bake for 15 to 20 minutes, until set, puffed and golden on top. Serve with a kale salad or soup to make it a hearty meal. This recipe is fast, nutritious and oh, so satisfying on those cool autumn days when you’re craving a little comfort food.